100 euros in cash, or a credit card such as Visa or MasterCard. 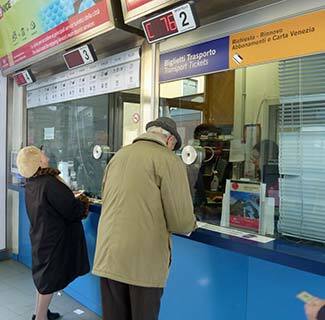 Inside the Hellovenezia office, you'll see a machine that dispenses numbered tickets. Press the button for a ticket with a letter and a number (ours was "C79"). At the window, you'll be given a form in Italian to fill out. You'll also need to give the materials from step 1 (passport, copy of passport's photo and ID pages, payment) to the clerk. A reader has told us, that when she bought her card, she didn't need to complete the form: The clerk simply photocopied her passport's ID pages. 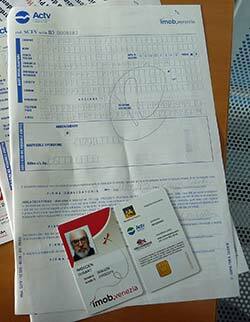 That hasn't been our experience at either of the two Hellovenezia offices that we've used (Piazzale Roma and the Lido), but if the clerk doesn't require you to fill in a form, don't argue--just accept your Carta Unica and say "Grazie." The clerk will accept your completed application form, take your photo or copy your passport's photo with a computer camera, enter your data into a computer, and---within a minute or two--give you an Venezia Unica "smart card" with your photo, name, card number, and the card's expiration date on the front. Turn the heavy plastic card over, and you'll see that a microchip is embedded in the back. This chip contains your Venezia Unica account information and any stored value that you add to the card (such as prepaid electronic "tickets" or a monthly pass). If you wish, you can recharge your card with tickets (biglietti) or a pass (abbonamento) immediately at the office where you bought your card. Alternatively, you can buy tickets and passes at other ACTV ticket booths and machines, Hellovenezia offices,or authorized dealers such as tabaccherie (tobacconists), edicole (newsstands) and bars. You can even recharge your card online. 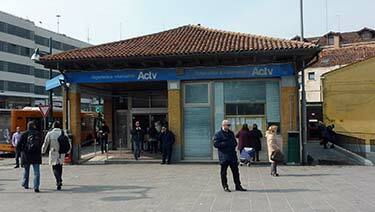 To use the Venezia Unica stored-value card, hold it within 6 cm (about 2½ inches) of the grey-and-white electronic card reader at any waterbus stop. When you hear a beep and the reader dispays the message "Buon Viaggio," you're ready to travel.